Colds and flus are not only inconvenient and uncomfortable, they can also be extremely dangerous — especially to the very young and the very old. Unfortunately, modern medicine has little to offer in the treatment of colds and flu. Colds and flus are not only inconvenient and uncomfortable, they can also be extremely dangerous — especially to the very young and the very old. Unfortunately, modern medicine has little to offer in the treatment of colds and flu. Fortunately, we do. There is no need to suffer from colds and flus for days, or weeks at a time. What we want to talk about is why and how bacteria and viruses, like bird flu, develop resistance to antibiotics and antiviral drugs. And more importantly, what you can do about it. Penicillin was discovered (actually rediscovered) by Dr. Alexander Fleming in 1928. But just four years after drug companies began mass-producing it in 1943, microbes began appearing that could resist it. Since then, we’ve seen penicillin-resistant strains of pneumonia, gonorrhea, and hospital-acquired intestinal infections join the list. And it’s not just penicillin. Bacteria resistant to most of the other antibiotics of choice have also appeared and proliferated on a regular basis. Antibiotic resistance to manmade drugs is almost impossible to stop since it is the result of some simple rules of evolution. Any population of organisms, bacteria included, naturally includes variants with unusual traits — in this case, the ability to withstand a particular antibiotic’s attack. When said antibiotic is used and kills the defenseless bacteria, it leaves behind those bacteria that can resist it. These renegade variants then multiply, increasing their numbers a million fold in a single day, instantly becoming the dominant variant. In other words, the very act of using an antibiotic creates the opportunity for strains resistant to it to flourish. It’s important to understand that antibiotics vary in the way they kill microbes. Penicillin, for example, kills bacteria by attaching to their cell walls and then breeching those walls, thus killing the bacteria. Erythromycin, tetracycline, and streptomycin, on the other hand, kill bacteria by attacking the structures inside the bacteria (ribosomes) that allow them to make proteins, thus also destroying the bacteria. Unfortunately, because each antibiotic is a single compound and one dimensional in its approach, it’s not that hard for microbes to “evolve” around such attacks. For example, microbes resistant to penicillin have developed cell walls different from the norm and that prevent the penicillin from binding. Similarly, other variants prevent antibiotics from binding to ribosomes, thus neutralize the effect of those antibiotics. Again, because antibiotics are one dimensional in their approach, it’s not that hard for microbes to “evolve” around them. Where it gets really frightening, though, is that bacteria swap genes like politicians swap favors — which brings us to vancomycin, the antibiotic of last resort. When all other antibiotics failed, doctors knew they could count on vancomycin. But then vancomycin resistance was discovered in a common hospital microbe, enterococcus. By 1991, 38 hospitals in the United States reported the variant. Just one year later, vancomycin resistant Staph bacteria were observed with the same gene. What this means is that not only are bacteria programmed to “evolve” defenses against antibiotics, but once they produce such a defense, they are also programmed to rapidly share that defense with other bacteria — thus rapidly spreading the resistance. Whereas bacteria are single-celled organisms, viruses are far simpler — more primitive even. Essentially, viruses consist of one type of biochemical (a nucleic acid, such as DNA or RNA) wrapped in another (protein). Viruses are so primitive, in fact, that most biologists do not consider them to be living things, but instead, they are considered infectious particles. Since antibiotics specifically attack bacteria, they are useless against viruses. For viruses, doctors rely on a much less effective group of drugs called antivirals. Tamiflu, which governments are currently stockpiling as bird flu insurance, is one such antiviral. When you think about how quickly pathogens “evolve around” antibiotic and antiviral drugs, it’s more than amazing that they have been unable to do so against most natural antipathogens such as garlic, olive leaf, and oil of oregano even given tens of thousands of years to do so. How does this happen? What is their secret? Actually, it’s quite simple – or more accurately, quite complex. Earlier, we talked about how drugs are essentially one dimensional, which allows microbes an easy avenue to evolve around them. Natural antipathogens, on the other hand, are anything but one dimensional. They often contain dozens of biochemicals. Not all of them are “active,” of course, but many of the so called non-active biochemicals work to potentiate the active ones and offer combinations with each other numbering in the thousands – presenting a complexity that makes it virtually impossible for microbes to work around. For a long time, many people thought there was only one active component in garlic, allicin (in fact, many companies still promote that concept). It was believed that raw garlic had very little biological activity, but when you “damage” garlic cloves – by slicing, cooking, or chewing them – the enzyme alliinase immediately converts non-active alliin into the active ingredient, allicin. As I mentioned, it was once thought that allicin was garlic’s principal active ingredient. However, researchers now know that allicin is rapidly oxidized. In the process of oxidation, allicin breaks down into more than 100 biologically active sulfur-containing compounds. While allicin may still serve as a general marker of garlic’s potency, research increasingly points to S-allylcysteine and other compounds as the most therapeutically active ingredients in garlic. So how many possible pathogenic defense combinations can you get from garlic’s 100 biologically active compounds? A whole bunch!! Thousands and thousands and thousands, in fact! And that’s the secret. But it gets even better. Several weeks ago, I upgraded my antipathogen formula. It contains 10 of the most powerful antipathogens found in nature. Everything that’s been said about Garlic can be said about onion. Onions and garlic share many of the same powerful sulfur bearing compounds that work so effectively as anti-viral and anti-bacterial agents. Ginger has been traditionally used to treat colds and flu. Chinese studies have shown that ginger helps kill influenza viruses (even avian flu), and an Indian report shows that it increases the immune system’s ability to fight infection. They are also diaphoretics and thus help raise the temperature of the body, which increases the activity of the body’s immune system. Like colloidal silver, liquid zinc is both anti-bacterial and anti-viral, but without the potential toxicity issues found with silver. Zinc is found in all body fluids, including the moisture in the eyes, lungs, nose, urine, and saliva. Proper zinc levels offer a defense against the entrance of pathogens. In the 1800’s, surgeons used zinc as an antiseptic/antibiotic after surgery; they noted its amazing healing properties. Wounds would heal, at times, as quickly as 24 hours after an operation, without swelling, and scarring was barely noticeable after a short period of time. Grapefruit seed extract was originally developed as an antiparasitic, but studies quickly showed that it had the ability to inhibit the growth of not only parasites, but fungi, viruses, and bacteria as well. The active ingredients of grapefruit seed extract are non-toxic and are synthesized from the seed and pulp of certified organically grown grapefruit. The process converts the grapefruit bioflavonoids (polyphenolics) into an extremely potent compound that is being used to kill strep, staph, salmonella, E. Coli, candida, herpes, influenza, parasites, fungi, and more. It’s the tincture medium for the formula, as opposed to alcohol (which is the tincture medium in an immune tonic). Not all herbs are created equal. When putting together a formula of this kind that is primarily herb-based, it is essential that you use herbs of the right quality — herbs that actually work. 99% of the herbs used by American companies do not come from the US. They are imported from Eastern Europe, and from many third-world countries such as India and China. Unfortunately, most (but not all growers) in these countries use large amounts of insecticides and pesticides in the growing of their herbs. DDT, for example, is still commonly used in Asia, whereas organophosphate nerve-gas based insecticides are commonly used throughout Eastern Europe. It’s also worth noting that most of the areas in which these herbs are grown in these countries are heavily polluted. The herbs are inundated by polluted rain and irrigated by polluted rivers. In Eastern Europe, for example, there was no environmental laws for decades. Rivers have been used as open sewers. Everything from chemical toxic waste to radioactive waste — no joke — has been dumped into these rivers. It will take many years for them to fully clean up. The reason most American companies use these herb sources, regardless of the problems just mentioned, is that they are cheap — with herbs costing just pennies a pound. Good quality organic and wildcrafted herbs cost as much as 20 times more. Before you use any company’s herbal formulations, you should learn where their herbs come from. Note: sometimes certain herbs (such as those used in Chinese or Ayurvedic medicine) are only grown in these countries. In that case, when using those herbs, it is essential that you work only with those ingredient suppliers that adhere to higher standards than their governments’ regulations require. Bottom line: I believe that this formula represents the best natural antipathogen option in the world today. And others agree. These ingredients seem fine for ordinarily healthy people but what about someone on COUMADIN, or Lipitor or blood pressure meds? I am on Coumadin and often find information on using natural products don’t take that into consideration and could cause lots of problems. I WAS TOLD BY MY DOCTOR I NEEDED COUMADEN EVERY DAY OR I WOULD HAVE A STROKE AND BE IN A NURSING HOME. SINCE THAT TIME I HAVE HAD MY NOSE IN THE COMPUTER EVERY DAY AND HAVE DISCOVERED THOSE THAT NEED COUMADEN ARE THOSE THAT EAT THE STANDARD AMERICAN DIET. MY A FIB WAS CONST ALL DAY VERY DAY THE WORST MY DOCTOR HAS SEEN. I WAS ALSO ON BLOOD PRESSURE MEDS. DON’T KNOW WHY BUT WAS ON METROPOLO. I HAVE NOT HAD ANY IN YEARS AND HAVE CHANGED MY DIET AND JUICE EVERY DAY EAT NO FRIED FOODS AND HAVE ALKALIZED MY BLOOD. BUILDING UP THE IMMUNE SYSTEM HAS NOTHING TO WITH COUMADEN. ONE THAT THINKS LIKE YOU WILL DIE YOUNG BECAUSE YOU BELIEVE YOUR DOCTORS AND REFUSE TO TAKE YOU HEALTH AND PUT YOUR LIFE INTO YOUR HANDS, AND INSTEAD TRUST YOUR ONE AND ONLY LIFE TO AN INDUSTRY THAT IS THE NUMBER 4 KILLER OF AMERICANS. I AM 67 AND MUCH HEALTHIER THAN WHEN I WAS 62 OR 63. I HAVE FOUND OUT MY A FIB WAS CAUSED BY ROOT CANALS BY MODERN DENTISTRY, ANOTHER INDUSTRY OUT TO KILL US WITH ROOT CANALS AND MERCURY FILLINGS. WAKE UP SMELL THE COFFEE TIME TO TAKE CHARGE OF YOUR OWN HEALTH. START WITH THE DIET AND READ AND LEARN. I totally agree with you. You should be commended for taking your health in your own hands. Knowledge is wealth. Dr Becker on tv everyday (your health) agrees with you. M.D.’s use fear to motivate you to medicate. I was told years ago that I would die of heart attack or stroke many years ago. I am still here, healthier than ever. I do read books about My health & take supplements to assist & maintain my health. I am a retired RN & I told that Dr. that I have seen way too many patients admitted to ICU & the hospitals taking way too many pharmaceuticals. No wonder they were so sick. My health has never been better. Very nice list. I have been taking a combination of grape seed extract, garlic, honey, olive leaf extract, vitamin c and vinegar for a low grade blood infection and I finally feel I’m getting somewhere after traditional antibiotics failed me. THis is an amazing article. Thank you for explaining this so thoroughly and in a way that is very easy to understand. From the list on the linked website, I cannot figure out where your “New/Natural Anti-Viral Formula” is located or available from. Please advise. Under our list on the page "Products" in top navigation bar, look for "Pathogen Destroyers" and the link next to it that says, "where to buy." The article on garlic properties is very impressive. I would like to inquire: Do we loose the medicinal value of garlic the moment we heat it? I was reading a recipe to make heart mixture in which garlic, ginger and lemon juice is cooked together with apple cider vinegar. I wonder if the healing properties of these herbs remain intact even after cooking for such a long time. I look forward to your expert comments. Love the formula! Intend to try to make it up for my kids and I but can you tell me what dosage you recommend please – upwards of 5 years of age and is it made in about equal quantities? As you can see from the instructions on Baseline Nutritional’s Super ViraGon formula, many parents have used this formula with their peditrician's approval and guidance on amount. http://www.baselinenutritionals.com/products/super-viragon.php&nbsp; For more questions, you can contact the company's customer support. Where can I buy the anti pathogen formula as a supplement? Can you purchase the antiviral formula mentioned here? If yes how much is it and how do we purchase it? I found the article very interesting but I have a problem or rather my wife has a problem with garlic. After throat investigation some years ago she found that eating garlic causes her throat to swell such that she has to be very careful not to eat it. Previously she used garlic in cooking & was quite happy with it. Is there any way that garlic could be usedd that would avoid this problem? If she’s now allergic to garlic, there’s probably not much you can do about it – unless she outgrows her allergy at a future date. Fortunately, there are some very powerful alternatives such as oil of oregano and olive leaf extract. Antibiotics are more properly called antibaceterials, to clarify they do not work against viruses. Zinc and silver work by preventing bacterial growth. Like the old practice of putting a silver dollar at the bottom of a milk barrel. Viruses are not living, they can be best thought of as human code segments with a small protective layer that hack our DNA which results in replication. Our DNA is filled with virus code and over 80% of the cells in our body are bacteria cells. Thank you so much for such a nice compliment! How can we continue to ignore “ultraviolet blood irradiation”? An FDA approved therapy used before penicillan was discovered. LOOK IT UP! IT WILL AMAZE YOU AND HAS NO SIDE EFFECTS. No “bugs” get resistant to the human immune system! Excellent article. Thanks a lot for the information. I am acutely suffering from cold and cough and this article will definitely helps me a lot. Fighting Viruses, and Winning; From the Flu to Bio Terrorism. by William Wong, ND, PhD. 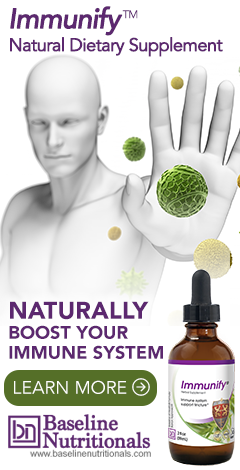 • Enzymes can also be the first line of defense against a virus! Those proteolytic enzymes do a number on the all-important exterior protein coating of the virus. They eat it! Remember the virus is active as long as it’s coating is in tact. What happens when a virus cannot complete and Isoprin bond? Well, simply it becomes inert – harmless! It was actually from Mr. Barron that I first heard about the importance of digestive enzymes and proteolytic enzymes. Mr. Barron has always been ahead of his time. 1. If I wanted to follow Dr. Wong’s suggested dose of five (up to 10) capsules three times per day, should I use the regular Digestive Enzymes from Baseline Nutritionals? Or, could I take that many pHi-Zymes from Baseline Nutritionals? The label on my bottle of pHi-Zymes recommends only 1-3 capsules daily. 2. Do you have any other advice for me, regarding the use of enzymes to help fight viruses in the body? 3. Do you have any advice, regarding using enzymes to help reduce scar tissue in the body? Lastly, I’ve used several Baseline Nutritionals products and found them all to be very helpful and high quality. I recommend the product line to everyone. Thank you for the excellent articles and great customer support! Have you any feedback on my questions? I have forwarded your questions to Baseline Nutritionals, your questiona are for them, not us. We do not sell products at the Baseline of Health Foundation. They should email you back shortly. Thank you for forwarding my questions to Baseline Nutritionals. I apologize for wrongly posting the questions in this forum. In the future, I’ll definitely direct my supplement-related questions directly to them. Thank you for helping me. Also, I did receive a directly reply from Baseline Nutritionals, regarding my questions. While they could not answer some of my questions, for legal reasons, they did provide me with other answers and supporting information to go read. Many thanks for your great Customer Service! As a rule, Jon Barron is very conservative with dosage recommendations as he has found that people tend to believe that whatever dosage is listed on a label, for them, more is better—sometimes using two, three, five times or more of the recommended dosage. So, in answer to your question, it is possible to take higher dosages of proteolytic enzymes for specific health goals, Jon recommends that if you do that, you do so with the guidance of a natural healer. Also, keep in mind, that different formulas have different strengths. Three capsules of one brand might be equivalent to 10 capsules of another. This provides yet another reason for working with a health professional. As for scar tissue, proteolytic enzymes are far better at dissolving arterial scar tissue VS dermal scars. Thanks again for the answers and great education!